Discussion in 'Traditional Folders and Fixed Blades' started by btb01, Sep 1, 2018. Back in January, I packed up my entire collection of pocket knives (along with the rest of our belongings) and moved them halfway across the country. Our first place in Minnesota was a rental house, which we knew would be short term while we searched for a home to purchase. We ended up living in that house for around 5 months, during which time we unpacked enough of our stuff to live normally, while leaving some unnecessary items in boxes to make them easier to move again once we found a home. Pocket knives, of course, made the cut for "items necessary to live normally" , so shortly after we arrived in MN, I began unpacking them and filling the drawers of the old parts cabinet in which I store them. I started with my GEC knives, as they're the most prominent brand in my collection, and the knives that I carry most often. Well, somewhere in the middle of unpacking knives, other "getting settled" duties called, and before I knew it, all the snow and ice from winter had melted, summer was practically upon us, and we had purchased a home and were ready to move our stuff yet again (this time by ourselves, but thankfully a much shorter distance — the house we purchased was literally just up the hill from the place we were renting). It was at this point that I realized I had only ever gotten around to unpacking my GEC knives, and that most of the other knives I own had remained packed away for months. Of course, this made them easy to move to the new house, but it also made me realize that I have a tendency to neglect many of the non-GEC knives in my collection when it comes to what makes it in my pocket. So, now that I have just about everything unpacked, I've decided to try a little experiment. For the month of September, I'm not going to carry any of my GEC knives. No #15’s or #77's, no #25’s or Bull Noses. Instead, I'm going to use this as an opportunity to carry knives that don't normally make it in my pocket. There are a few additional parameters I'm setting for myself that I hope will help to keep me out of my comfort zone a bit. Along with my GEC's, I’ll be shelving some other knives that I already carry occasionally (mostly Case knives, Opinels, etc.). My real goal here is to try and get knives into my pocket that haven’t been there before. Today I kicked things off by dropping my standard A. Wright's Ebony Lambsfoot in my pocket. I wanted to start this thing off with a Lambsfoot because, as I recently mentioned in the Lambsfoot thread, I have several (including three of @Jack Black's Guardians knives) but for whatever reason I rarely carry them. I meant to get a new photo of it today to add to this post, but the day sort of got away from and I never took one. I'll remedy that tomorrow, but for now, it's the bottom knife in this older photo. CharlieUK, veitsi_poika, Stropping Young Lad and 24 others like this. Cool experiment, Barrett. Looking forward to following this thread. neal70, Vaporstang and btb01 like this. I agree with Rick, Barrett. I'll be following this thread with interest. Who knows, it may lead to your adopting a formal rotation schedule! I’m looking forward to following along your adventure through this thread. May the journey be filled with pleasant surprises and end up with a few new favorites. I've not carried a GEC ever; probably never will. Vic Tinker, Kershaw Oso-Sweet and Link serve all my needs. No need for expensive "cult" knives. UnderDawgAl, Jak3 and neal70 like this. Great idea for at thread Barrett I will be following it. neal70 and btb01 like this. I've never owned a GEC, but I can relate. 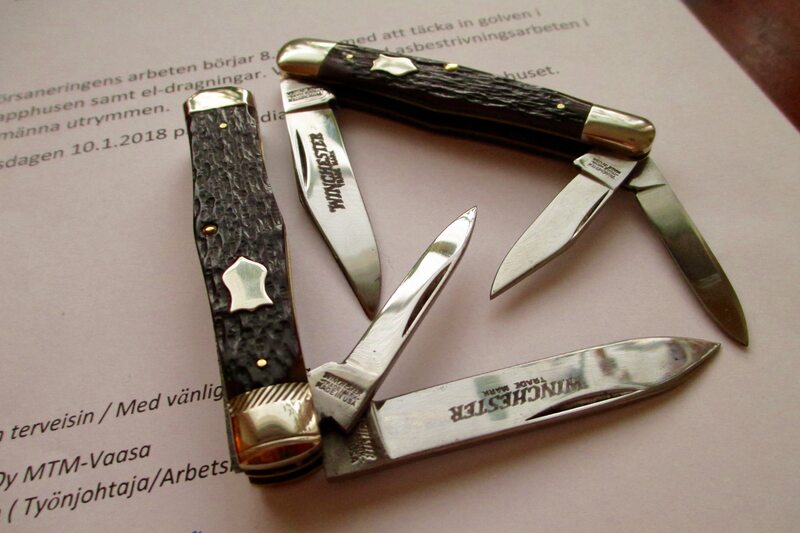 A Buck 301 Stockman seems to have displaced all my other stockmans, plus all the Barlows, Canoes, and other two blade patterns I used to carry from my pocket. UnderDawgAl, neal70 and btb01 like this. I get where you're coming from. I have so many knives that if I carried a different knife every day it would take me a year-plus to carry them all. Maybe two years-plus. Prester John, neal70, Will Power and 3 others like this. Cool idea Barrett Lambsfoot content a bonus! I get where you're coming from. I have so many knives that if I carried a different knief every day it would take me a year-plus to carry them all. Maybe two years-plus. dc50, Prester John, neal70 and 1 other person like this. I'm not much on correcting others, but I'd be hard pressed to define GEC's customers as "cultists." leghog, r redden, Dr-Mabuse and 10 others like this. I'm the same way. You'd think that I have enough knives but just in the month August I bought 32 maybe 33 more knives - all of them new that month. Where it'll end I don't know but I've still got a lot of empty boxes and drawers. neal70, Jsega51, btb01 and 2 others like this. neal70, btb01 and JohnDF like this. r redden, Dr-Mabuse, neal70 and 2 others like this. Okay Alan ... but isn't that a kool-aid mustache your'e sporting?... hmm...? t.willy, neal70, btb01 and 1 other person like this. Maybe milk with a shot of Jobn Lloyd. r redden, neal70, Jack Black and 2 others like this. You got it BAD Ed! Prester John, neal70 and btb01 like this. It’s been a long time since I’ve carried a GEC. Don’t worry, you’ll be just fine. Prester John, neal70, Fodderwing and 2 others like this. Thanks for the comments so far, everyone! I doubt that I'll be adopting an Excel spreadsheet schedule, but hopefully it will influence my carry habits a bit. I figured some folks would be able to relate, whether the knives they habitually carry are GEC's or not. 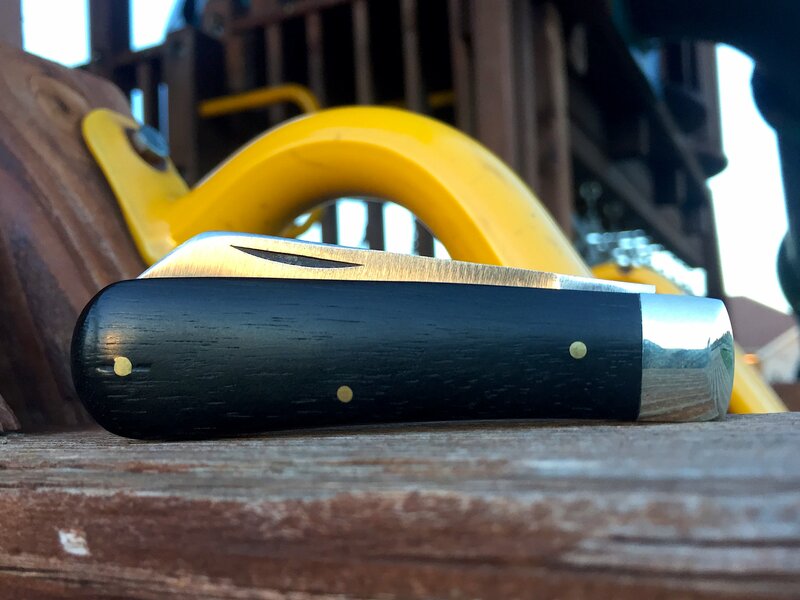 I'm sure there are guys who carry Case knives most often, or Buck knives, or any other brand, and end up neglecting other knives in their collection. I'd also encourage anyone who finds themselves in a similar habit of carrying certain knives and neglecting others to maybe join in and go outside their normal rotation. Posts about it would, of course, be welcome here. 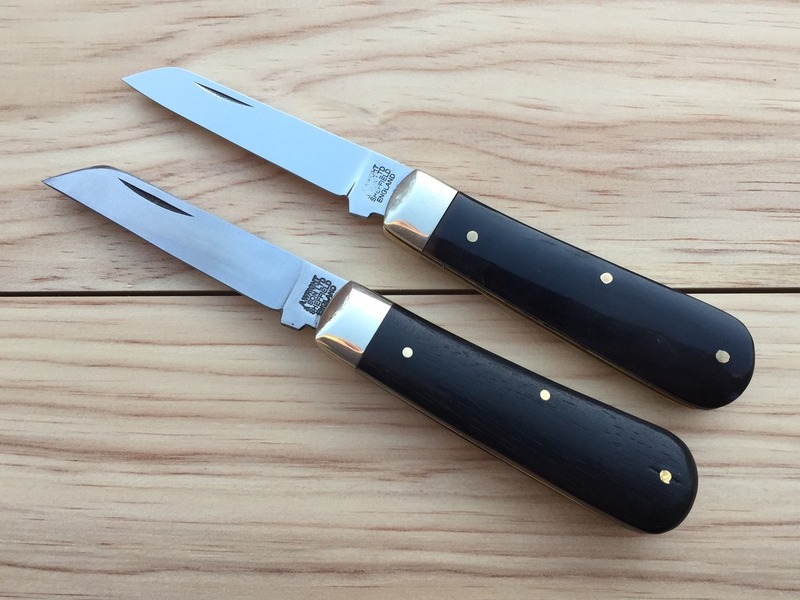 Ironically enough, on Day Two (yesterday) I purchased two new GEC knives off the exchange. Still, they won't be carried until October at the earliest. I posted about some difficulties I had with sharpening this particular Lambsfoot in the Guardians thread sometime back. The grinds are a bit uneven, and the bevels ended up looking a little odd by the time I got a good edge on it using flat stones, but one thing's for sure -- it'll cut! veitsi_poika, Jack Black, r redden and 5 others like this. When I was driving truck, the TA in Rogers, MN. was one of my favorite places to park and reset my daily 14 hour (and when possible, my weekly 70 hour) drive time clock. Good idea, routine can make us complacent and miss gems by neglect. Looking forward to your future posts Barrett. veitsi_poika, Jack Black, r redden and 6 others like this.